Is it possible to update a ticket when the private message gets archived in the fb business manager? Our use case is that the marketing team replies to the "easy ones" directly via facebook, i want to close the tickets then with a trigger. Yes, it is possible to update a ticket when the private message gets archived in Facebook. Archiving the conversation in Facebook just hides it from your inbox until the next time you chat with that person. So commenting on that ticket again just picks up the chat where you left off. Hi there, I was wondering about the 2 FB pages limit that is still in place - I see this was discussed a couple years ago and that there were issues with FBs API. However, these days even Freshdesk allows for unlimited FB pages integration so I don't see a reason why Zendesk wouldn't offer the same. Any updates on this front? Thanks! We're actively investigating whether we can remove the limit or not. We would like to, but we had some doubts about whether we can be sure all of our API calls will make it through, but the prognosis seems good. We'll be working on this soon. I recently became aware of this Facebook integration feature and wanted to see if I could get some help on 1 thing. If it was mentioned before, I apologize for making you repeat any reply. I was able to incorporate our company's facebook page without any trouble but since out company develops many different games, we have our tickets separated in Views. Is there a way I can separate the Facebook posts and Private messages into another View? If so, how can I go about doing that? I've tried messing around with it today but I couldn't seem to figure it out. @Brian - We have conditions in the Views menu that allow you to include or exclude various channels. You can use the condition [Ticket: Channel] to create these. There are options for both Facebook Post and Facebook Private Message. Is there anything else I'd need to include? Thanks a lot for your help. I'll try this and let you know how that works. Max - Any ETA on the removal of FB page limits beyond soon? Just curious if this is something that may happen within the next quarter or if we're looking at a year or more down the road before a decision is made. We have actually begun to do some investigation. We're not ready to commit to a time frame, but have begun to escalate the priority now that we're feeling safer about API limits. I wanted to ask regarding the page limits. "You can add up to fifteen Facebook Page to the Facebook channel. You have to be an administrator or have appropriate role permissions to set up the Facebook channel in Zendesk." As I see in a discussion, the talk is about the limit of 2 pages per accounts. Thus, could please anyone clarify if it's 2 or it was increased to 15? Or maybe I am mixing up the channels and pages, not sure. Thank in advance for the answer. Thank you very much for your answer and for that awesome news! What about creating tickets from Fb user posts, mentioning specific Fb page? Technically if a user @ mentions your page, that will be converted into a ticket as well. We plan to eventually make that a separate option, but right now it's treated in the same way as a wall post. If someone @ mentions your page in a comment (rather than a post) it will not be captured at this time. The only issue I have at the moment is with the opening of links from our Facebook Business managed page. Are there any plans to improve this functionality? When I allow Facebook posts to convert into tickets, then someone comments on this post and I reply to him, my reply appear no Facebook as another comment, not as a reply to that person. Is there a way to make my reply becomes a reply to the user, not a new comment on the post? I appreciate if someone can answer me, please. At present the ability for a Facebook ticket reply to appear as a reply on the post as opposed to a comment is not currently possible. I see you've already posted some feedback on the feature request post HERE regarding this. We'll reach out to our product managers to see if we can get an update to this for you asap. 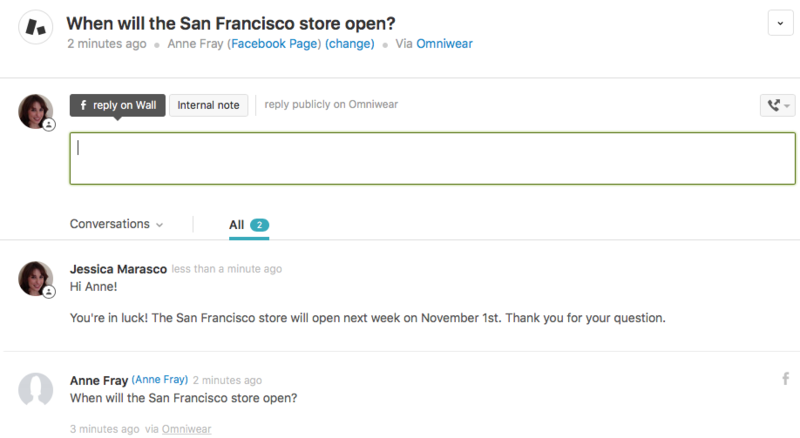 Can someone confirm if you can manage Facebook Ad comments via Zendesk integration? I am not sure if it works, we had wall posts including our own posts enabled and our ads never occurred there. Bear in mind that Zendesk does not handle reply-to comments in a proper way, so even when it would fetch the ads, it is pretty useless i would say. 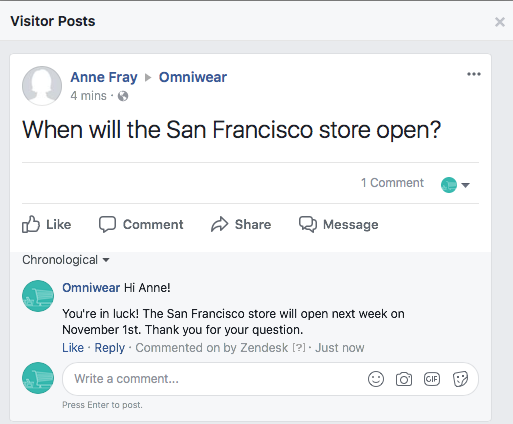 I understood that with Zendesk we can effectively manage 1) facebook private messages and 2) comments from users on your pinwall. 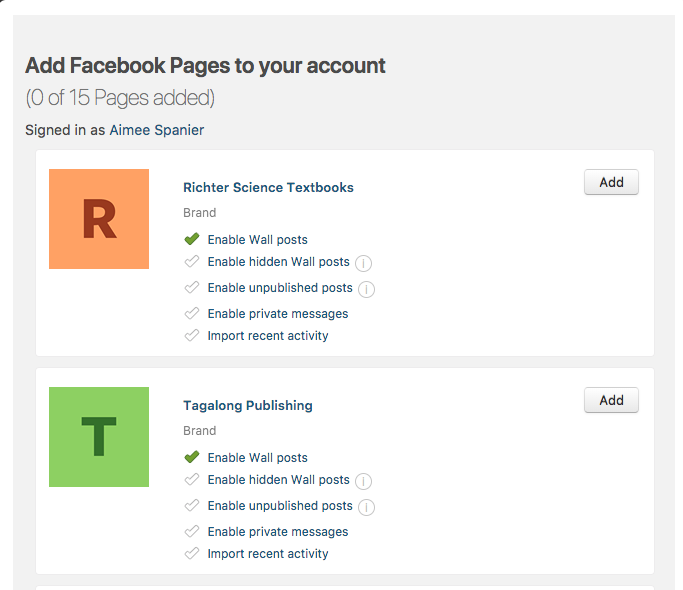 3) Being able to manage facebook groups with zendesk not only pages?! Is any of these features already implemented and I missed it or do you plan to implement any of these features in the near future? Thanks for your help! We use Facebook Enterprise platform, zendesk support can not use it to integrate channel, always display we have no one fanpage. I'm afraid I don't quite understand what you're asking...are you having problems connecting your Facebook page to your Zendesk? I was wondering if I am removed as an admin from our companies FB page will I still have the ability to respond to tickets through Zendesk? The reason I ask is that the person who set up our integration said I also had to be an admin on our FB page.. Is this really the case? As long as there aren't any restrictions set up in your Zendesk that would prevent you from seeing or interacting with those tickets, you should be able to respond to them even if you're not an admin on the FB page. Is there a way to manually select certain FB posts to create a ticket? We have a FB page for our sales team and the majority of the chatter on that page is sharing of best practices. I need my team to be able to identify certain posts to convert them to tickets. Is this functionality available or is it an all or none thing? At this time it wouldn't be possible to manually convert specific wall posts to tickets at present. I can certainly see the benefit of this and will happily log this as a feature request so that our product managers can look into this for future updates to our Facebook integration. A big +1 for a feature for our Facebook admins / Comms team to manually decide that it's a support ticket. I imagine something like the "Create a ticket" button in Help Center comments. The full Facebook channel in Zendesk produces too much noise, while the support team switching over to FB as needed is not scalable. We started evaluating the Hootsuite/Zendesk integration last week to accomplish this task. Seems like a viable solution.